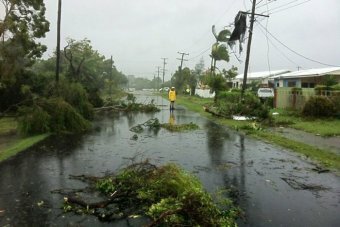 Queensland is enduring tornado activity, torrential rainfall and major flooding as ex-tropical cyclone Oswald makes its way south. On Sunday morning severe weather warnings were issued for regions stretching from central Queensland to the NSW border. 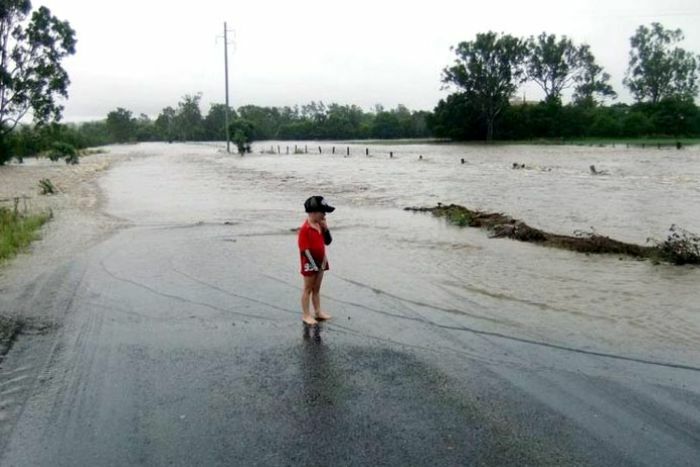 Hundreds of homes and businesses were threatened by floodwaters in Bundaberg, while homes near Gladstone also faced inundation. 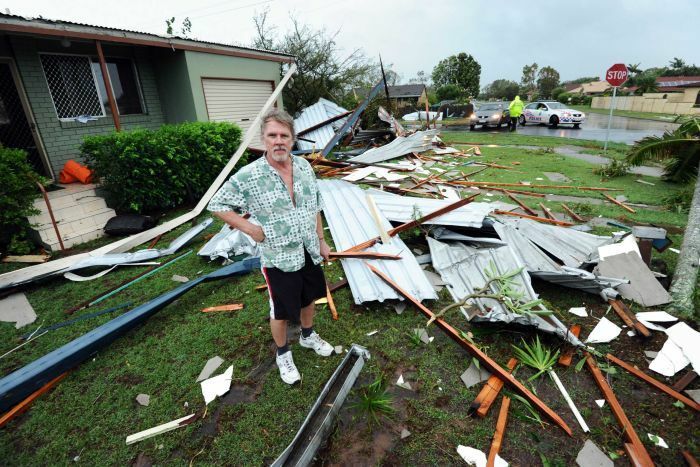 The Sunshine Coast and Brisbane were warned of possible tornadoes, after at least five tornadoes caused widespread destruction in the Wide Bay yesterday. 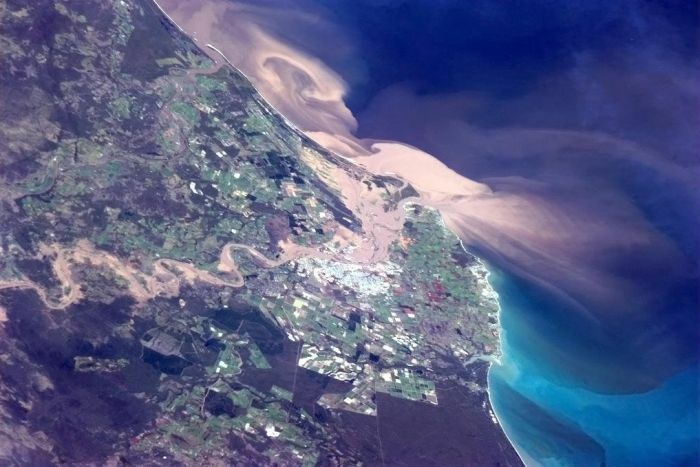 A storm surge also caused extensive erosion and some flooding in the Moreton Bay region. 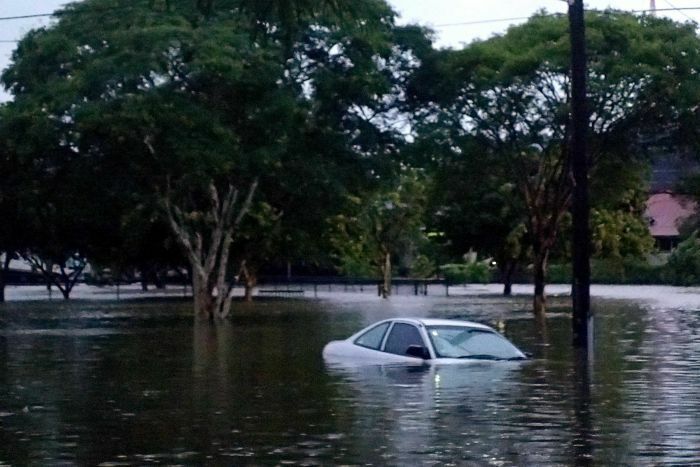 Here, look back on how the weather situation unfolded on Sunday morning. For the latest updates, visit our live afternoon coverage. 11.31am: In Bundaberg, the Bruce Highway is cut both north and south. 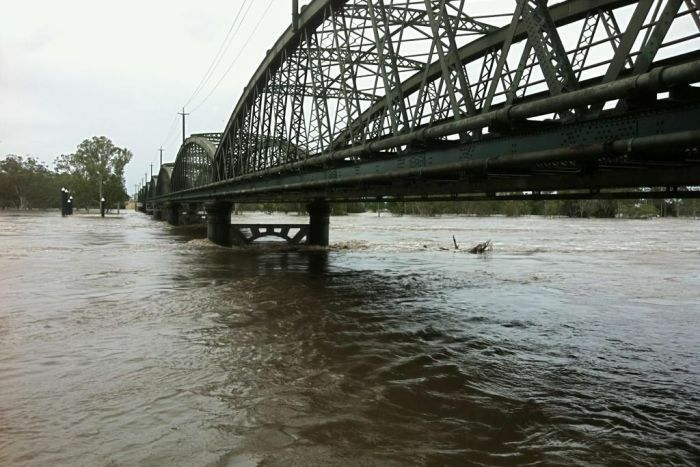 The Burnett Bridge is now closed to traffic as river levels continue to rise. 11.24am: There have been reports of windows imploding in apartments along Alexandra Headland on the Sunshine Coast. 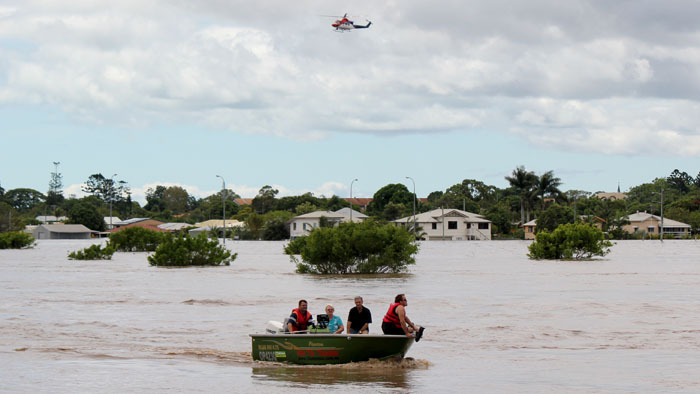 11.23am: A spokesman for Premier Campbell Newman says the State Government has requested Army helicopters to help deal with the crisis. More information on that when it comes to hand. 11.22am: Ergon Energy says there are 6,500 homes without power in Toowoomba. 11.19am: The severe weather warning for the Capricornia region has just been cancelled. 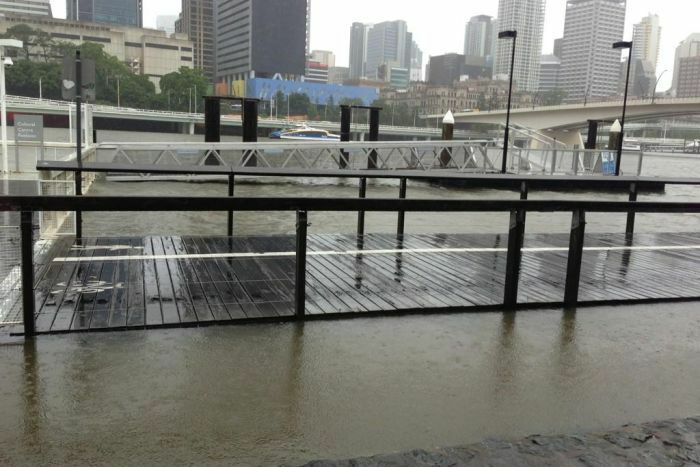 11.09am: The Brisbane River is rising as heavy downpours continue in the city. A severe weather warning also has been issued for northern NSW. Read that warning here. 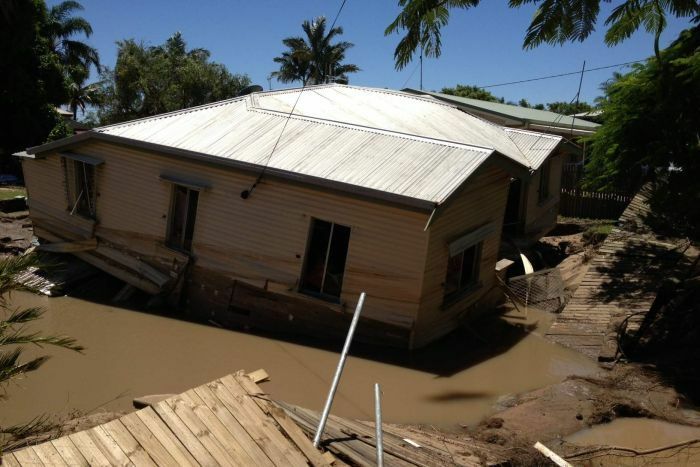 10.56am: In the Gladstone region, residents in the Boyne Tannum area are seeing unprecedented flood levels. 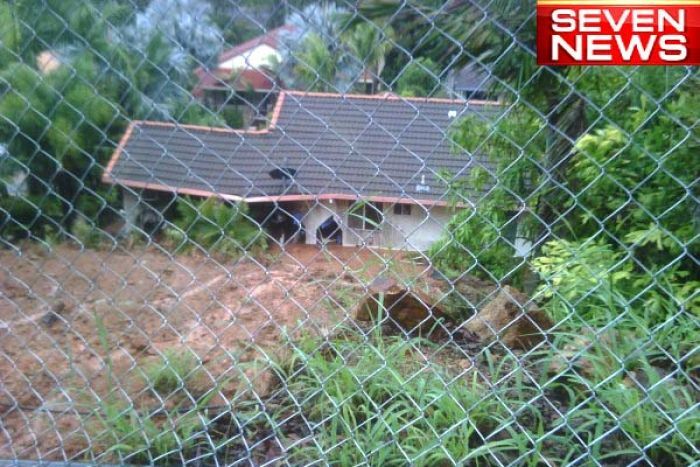 More than 900 homes have been evacuated as 8.5 metres of water goes over the spillway at the Awoonga Dam. 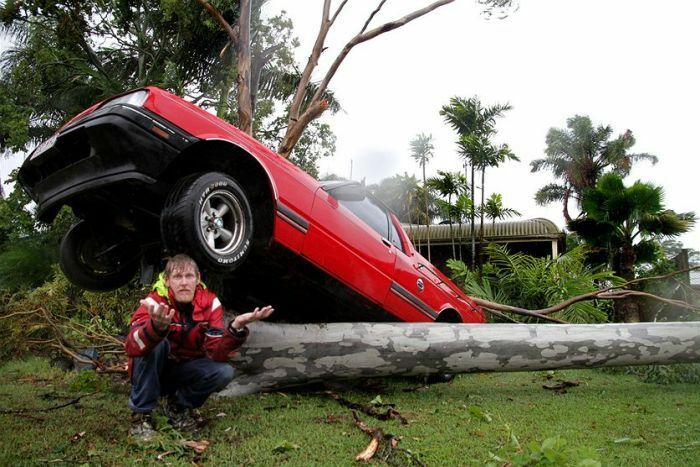 “A man who was camping out at Flutter Creek and woke up at 11.30 last night and his car was going under. “So he walked from Flutter Creek to the Calliope police station and the police brought him into the evacuation centre this morning. 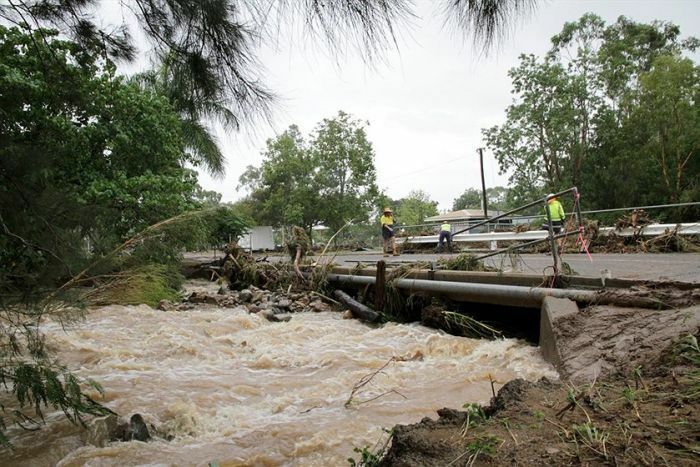 10.47am: Queensland Premier Campbell Newman says the State Disaster Management Group is meeting to determine what resources are needed to deal with the wild weather. “I have been in communication with the Prime Minister over the last 24 hours. “I know that she and her Government will provide the support that we need. 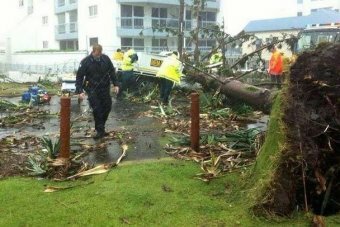 10.44am: In Coffs Harbour in New South Wales, emergency services have been preparing for the severe weather system to hit the region. Yesterday 10 Swift Water Rescue teams flew into Coffs Harbour. 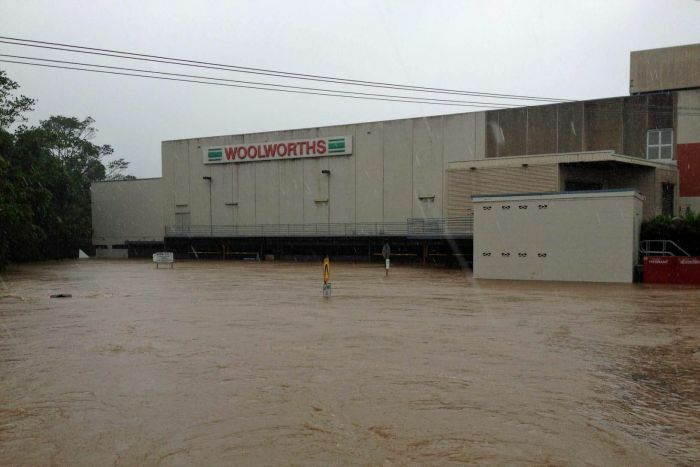 There is also sandbagging of low lying businesses and homes in the town centre and along Coffs Creek. 10.26am: Police have received reports that the Bruce Highway at Gin Gin will be closed for 24 hours. 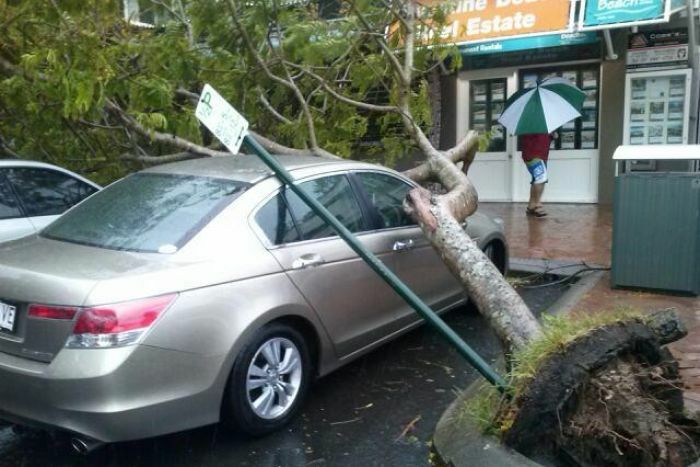 10.21am: Areas of the Sunshine Coast are feeling the force of the storm system. @joshbavas Mooloolaba Beach starting to cop it now. Branches down on cars. Rivers and sea rising. Cafes losing signs etc. 10.16am: There has been extensive erosion and some flooding from a surge affecting coastal areas in the Moreton Bay region. “I have never in all my years seen waves as big crashing over the rock wall in front of Redcliffe and the end of the jetty is underwater. 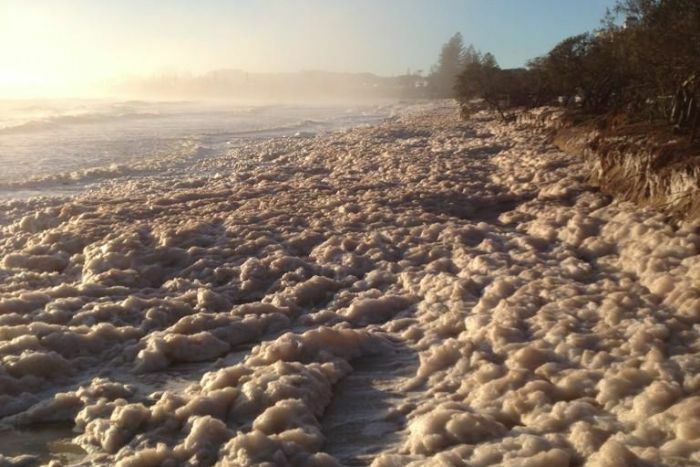 “There is at least a three to four metre swell. In Redlands, Mayor Karen Williams says the Victoria Point pontoon is on its side and out of action. 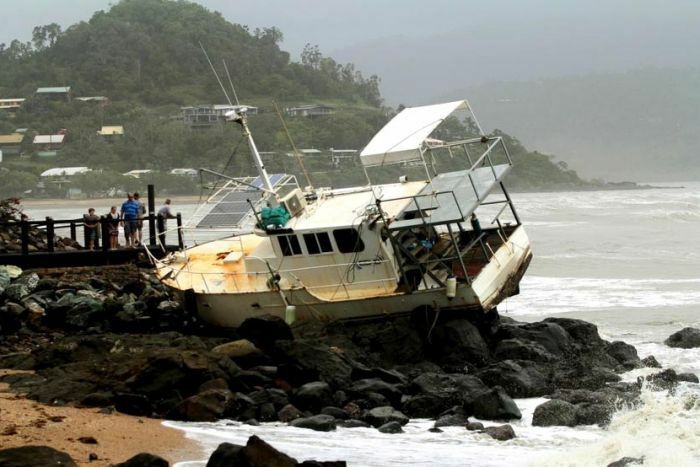 10.11am: Queensland Premier Campbell Newman has told the ABC it is “highly likely” the Defence Force will be called in to help deal with the weather chaos. The State Disaster Management Group is meeting at the moment. More on that breaking news as it comes to hand. 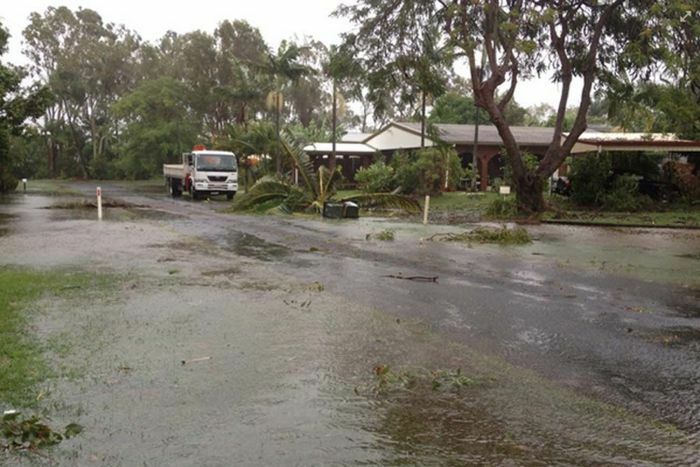 10.01am: North of the Sunshine Coast, Hervey Bay is now cut off by floodwaters. 10.00am: The Burnett River west of Bundaberg is now above 2010 flood levels and is expected to rise another metre today. 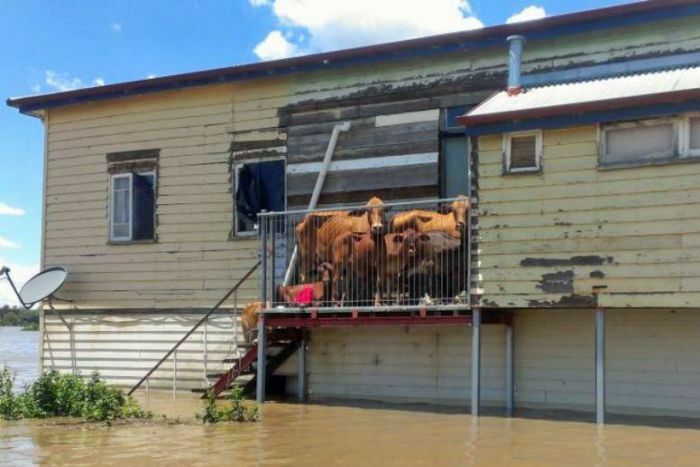 The Weather Bureau says it could reach levels not seen in more than 70 years, and hundreds of properties are at risk. 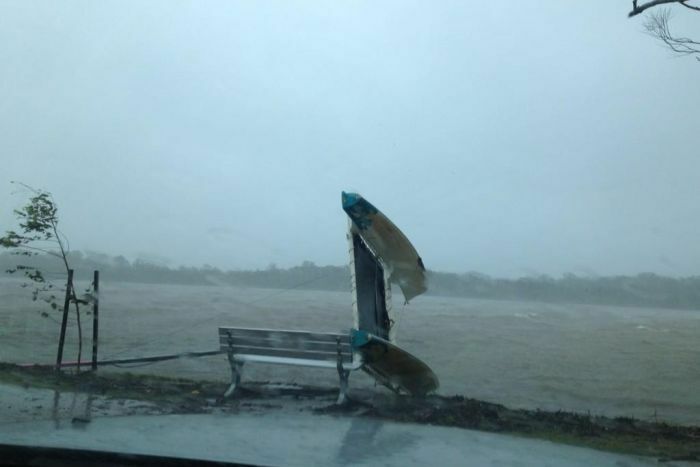 @abcwidebay The Burnett River is moving very rapidly at the moment, boats are flailing around in the wind and crashing into each other. 9.50am: Here’s some updates on road closures. You can check for road closures in your area here. 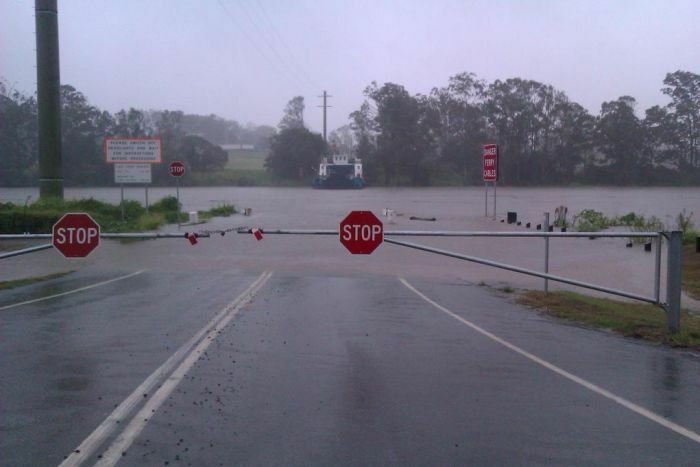 @joshbavas Some of the bigger roads closed from flooding. D’Aguilar Hwy near Woodford and Bruce Hwy south of Miriam Vale. 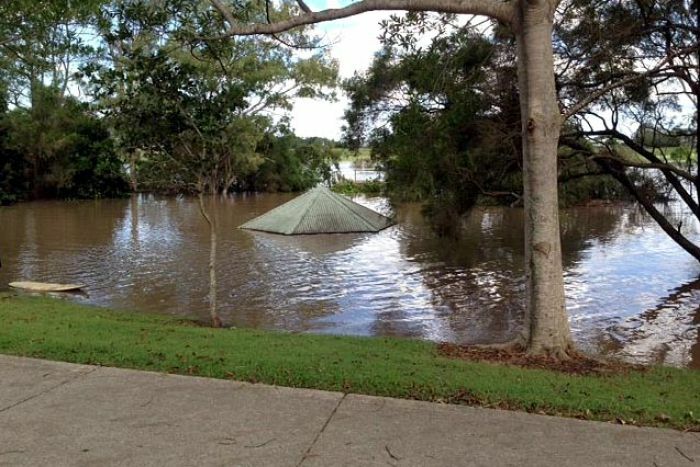 9.44am: At Noosaville on the state’s Sunshine Coast, the Noosa River has broken its banks along Gympie Terrace. “We have seen about four or five boats crashing into each other flowing down the river. 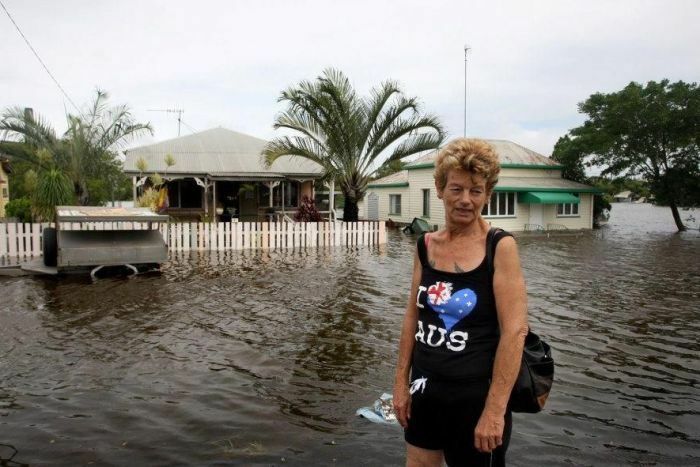 “There are people dumbfounded looking across the river thinking ‘how can this happen again?’ We had the 2010 floods that were devastating for Bundaberg but this year they’re saying it is going to be worse than that. 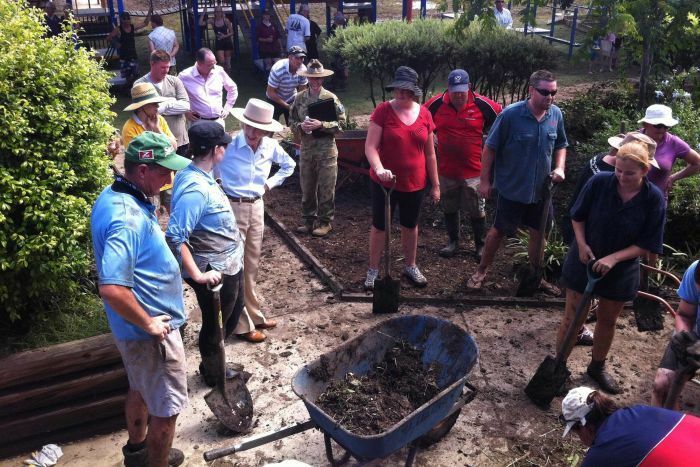 “We just spoke to a business owner who had his business washed away in the 2010 floods and he had only just started rebuilding and then overnight the floodwaters hit and he got inundated. 9.35am: John Taylor has shared this photo with the ABC via Twitter. 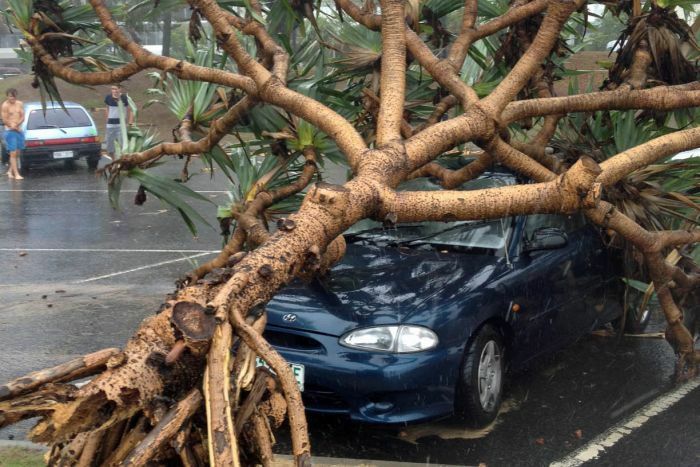 It shows a tree that has fallen onto a car at Noosa. 9.34am: A man has escaped with only minor injuries after his boat was hit by another vessel in Rockhampton. Police say floodwater caused the moorings to break and pushed the boats into each other before they drifted down the Fitzroy River. 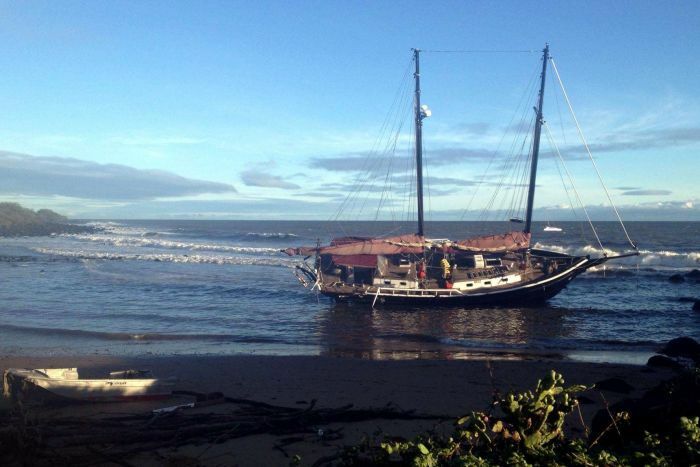 The boat that struck the moored vessel capsized and sunk while water police rescued the man on the other boat several hours later. 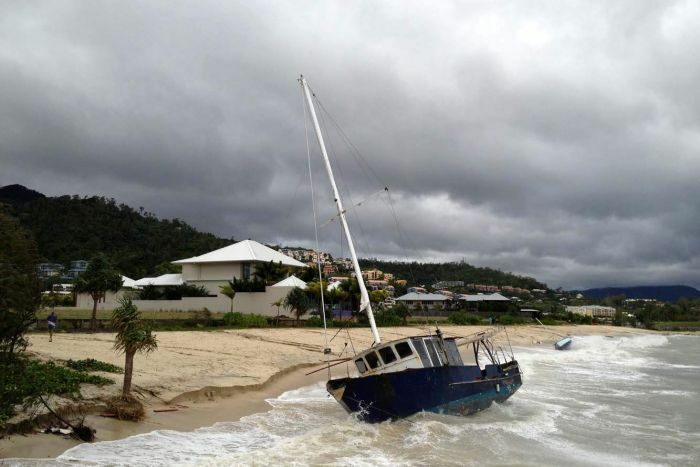 Police are appealing for the owner of the sunken boat to contact them. 9.23am: The Weather Bureau says moderate flooding has developed at Bundaberg with major flooding expected during Sunday. Read the flood warning here. 9.14am: A power update from Energex: There are currently 30,000 homes without power across the south-east. Power has been restored to 28,000. 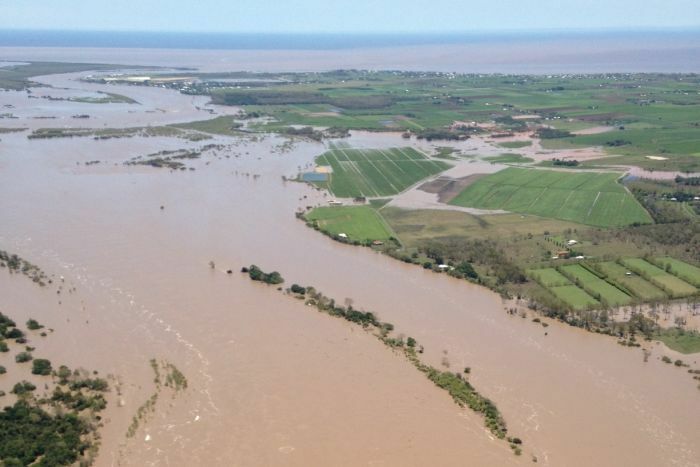 9.05am: The Boyne Tannum area near Gladstone is seeing unprecedented flood levels. A high tide of 4.25 metres is expected this morning and more than 900 homes have now been evacuated. 9.04am: A swift water rescue crew has lost its boat and equipment trying to save three people in a flooded creek west of Gympie. 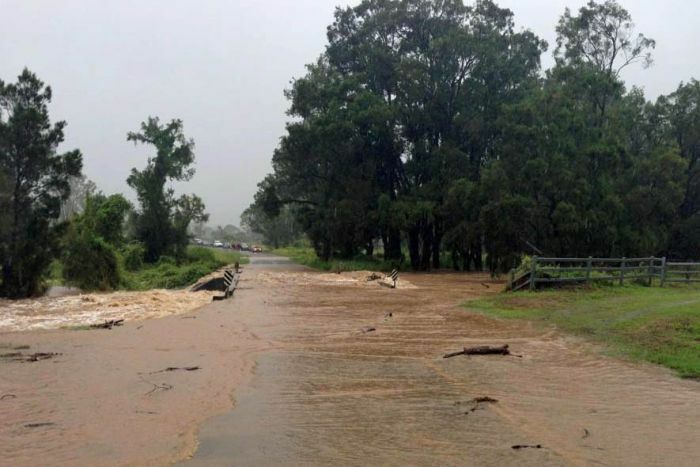 A 27-year-old man is missing, a woman is clinging to a tree and another person has been rescued from the flooded Widgee Creek. Their car was washed off a flooded causeway early this morning, and the rescue crew lost their boat and rescue gear trying to save them. 9.03am: Rescue crews in central Queensland are trying to reach a woman trapped on her car in Grevillea Creek near Biloela. Banana Shire Mayor Ron Carige says the woman has been clinging to her car and a tree since 3.00am. 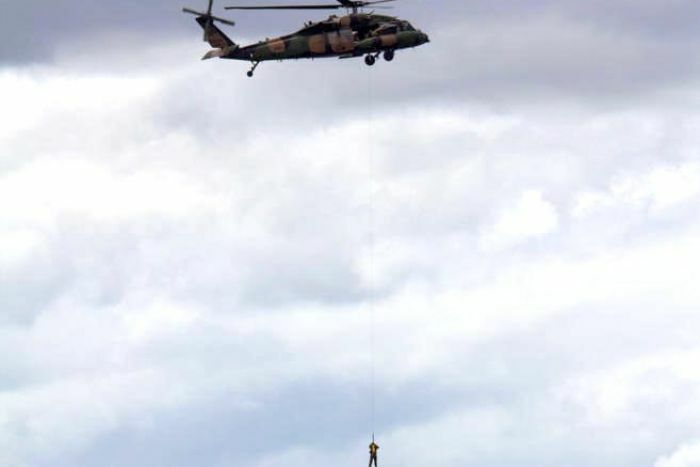 He says he is hoping to get some help from a rescue helicopter from Rockhampton or Gladstone. 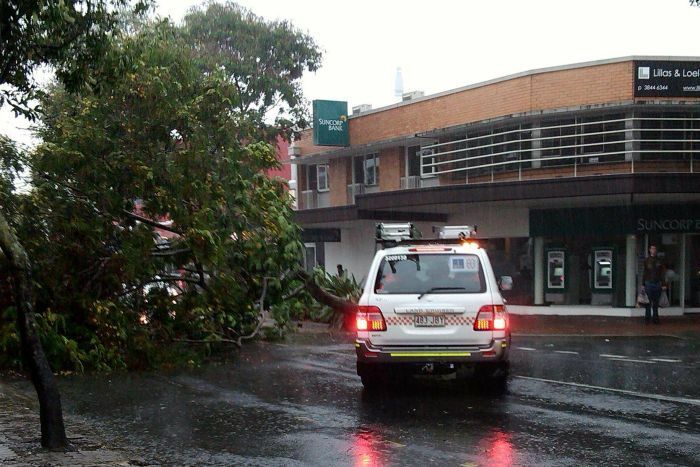 9.00am: Queensland Police have received reports of trees and powerlines down in Toowoomba, west of Brisbane. They say the area is experiencing strong wind gusts, and have warned locals to stay off the road. 8.56am: A flood warning has been issued for the Stanley and Brisbane rivers above Wivenhoe dam. 8.40am: Parts of northern New South Wales are starting to receive heavy rainfall as Queensland’s storm system moves south. 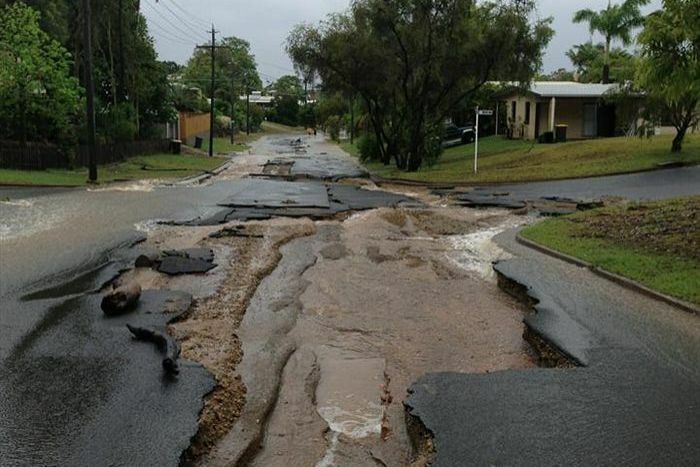 The SES says the largest falls so far have been in the Tweed area, with 176 millimetres at Hopman’s Creek. 8.29am: The Sunshine Coast airport at Marcoola will be closed for the rest of the day. All beaches in the region are also closed today. 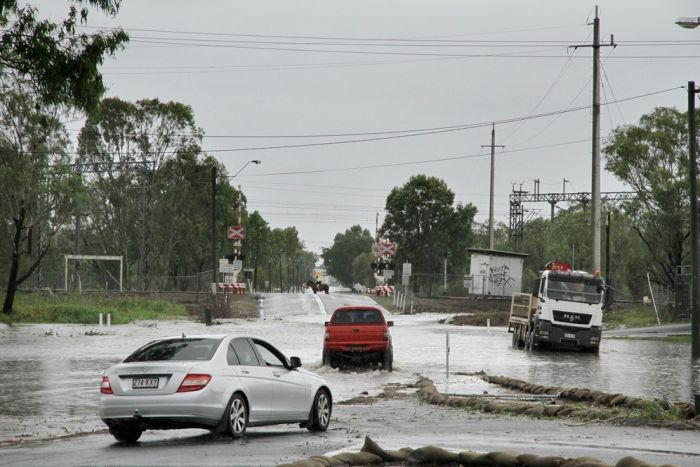 Buses are also replacing trains on the Sunshine Coast line between Caboolture and Nambour due to the severe weather. 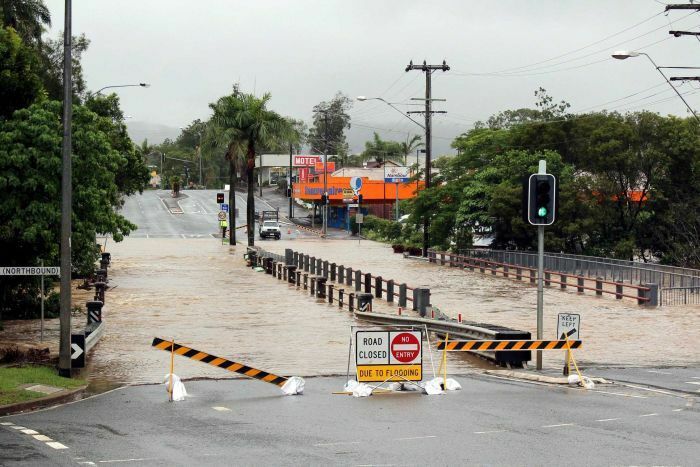 However, buses cannot access Mooloolah, Eudlo and Palmwoods stations so there is no public transport available (train or bus) from these locations. “Two years ago when we had the big floods here, we had rain spasmodically over a period of weeks. Since last Tuesday night it hasn’t stopped raining basically. “There is still more to come down from the upper reaches of the Burnett. This morning they are saying that the flood levels from 2011, which were significantly high, it’s going to be higher this time. 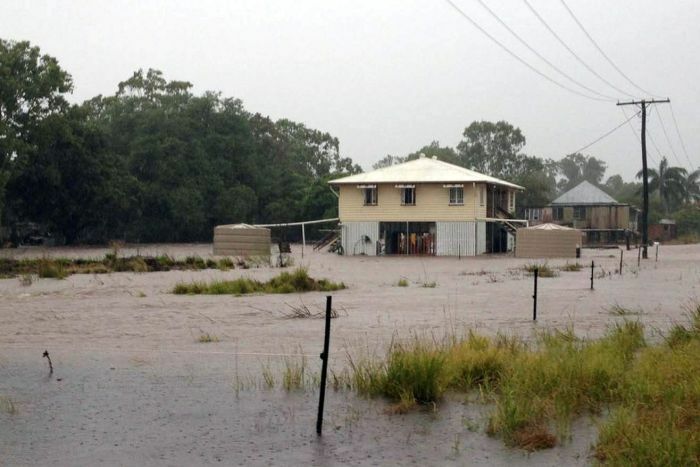 8.11am: Flooded homes at Goomeri, Kilkivan and Woolooga, west of Gympie on the Sunshine Coast, have been evacuated. 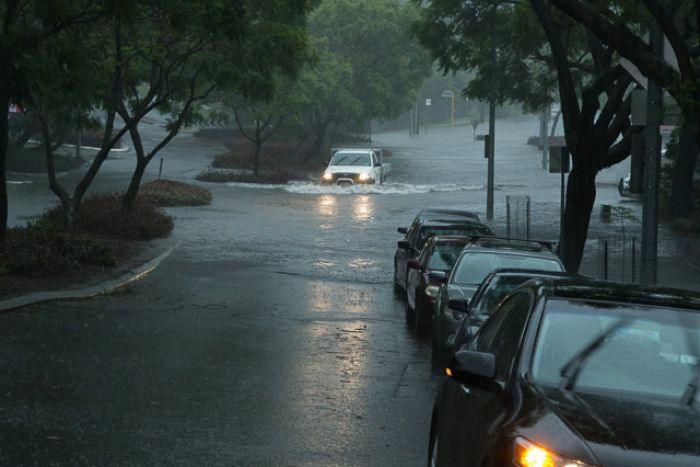 8.00am: The Moreton Bay Regional Council says a flood warning has been issued to Burpengary residents in Dale Street. 7.57am: Energex says there are 1,053 customers without power in Moreton Bay, and 2,226 in the Gympie/Sunshine Coast area. Check the Energex website for updates. 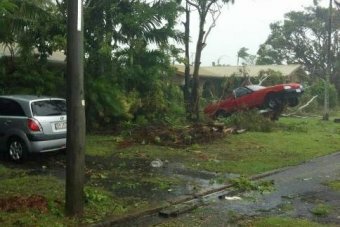 7.55am: Emergency Management Queensland says it is gearing up for tornadoes in the south-east today. 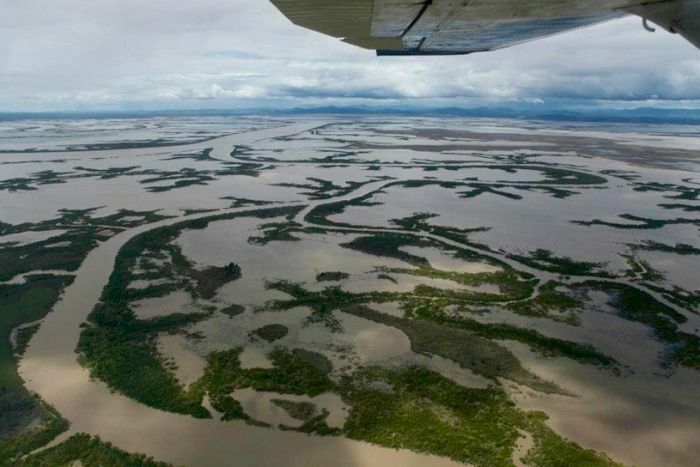 Assistant director general Bruce Grady says advice from the Bureau of Meteorology strongly suggests there will be more systems impacting the Wide Bay, Burnett regions and areas to the south. “If you are unfortunate for one of these tornadoes to affect your property the safest place is in the smallest room in the house, usually the bathroom or the toilet. The Nambour Showgrounds will be open for caravans from 9.00am. 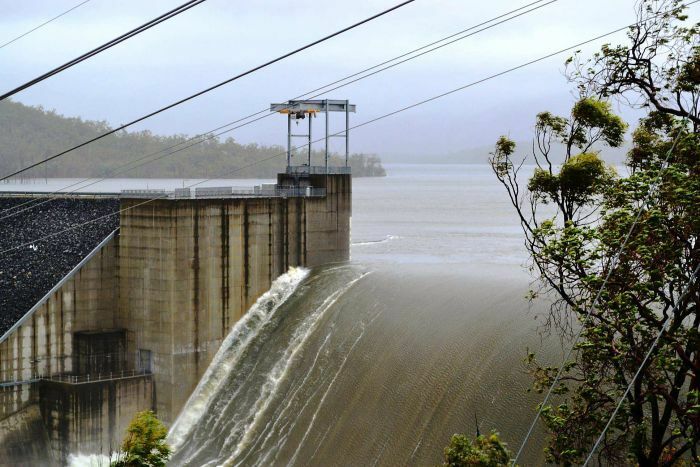 7.35am: More water is being released from Wivenhoe dam west of Brisbane ahead of the big drenching expected later today. Overnight the release rate was more than doubled to 900 cubic metres per second. 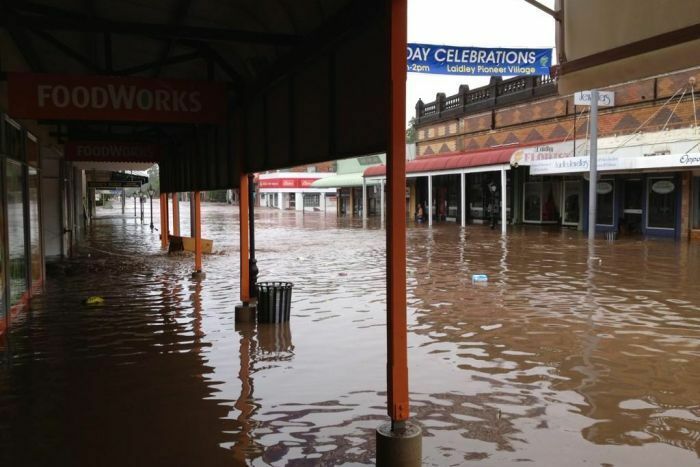 7.33am: More than 200 homes and 100 businesses will flood across Bundaberg today if the Burnett River continues to rise. 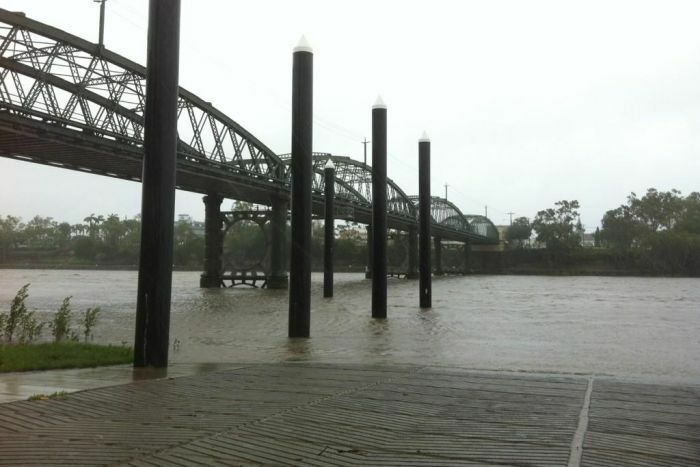 The river is at 5.5-metres and is expected to reach more than seven metres this afternoon. 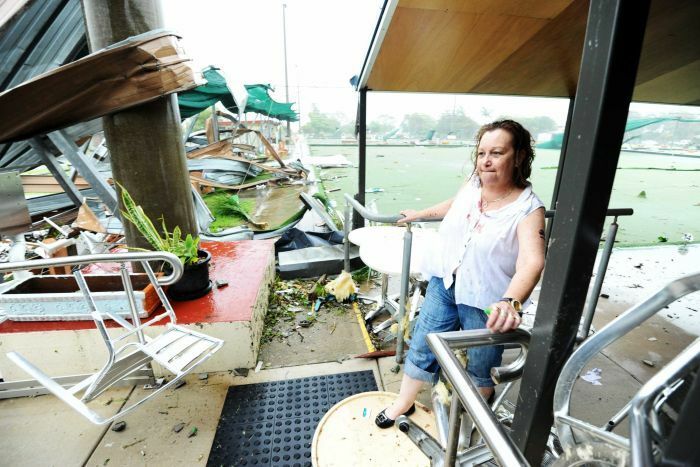 Two houses and the cricket ground at Bundaberg East were destroyed by strong winds and flood waters overnight. Riverdale Caravan Park and more than 10 businesses at North Bundaberg are flooded. “Several houses have lost their roofs and several businesses as well. A large bowls club has lost its roof and part of that roof and ended up in the carpark of the local supermarket, which is about three blocks away. 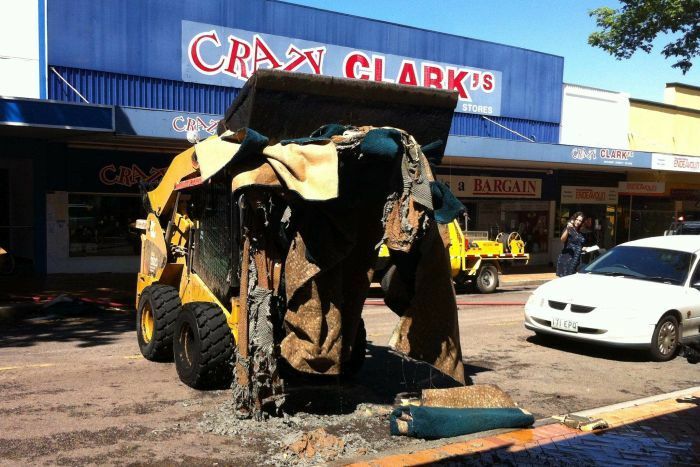 “The supermarket and the shops there ended have also suffered damage as well. I’m driving around this morning and it is still pretty quiet. There’s not much people can do at this stage stage. “There are powerlines down everywhere. It seems like it is going to take quite some time to get that all back up and running again. 7.20am: The Bruce Highway between Rockhampton and Gladstone is now open. “I think the whole region is going to be pretty badly hit. 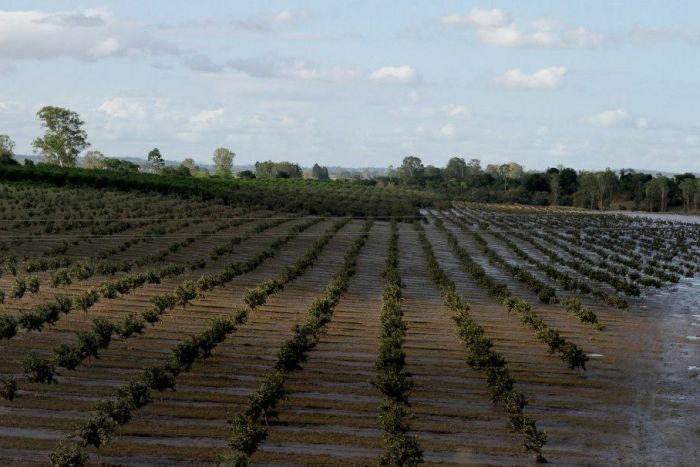 “South of Gladstone we’ve got Awoonga Dam with eight metres of water rushing over the top of the spillway – that’s never been seen before. They evacuated 400 people. 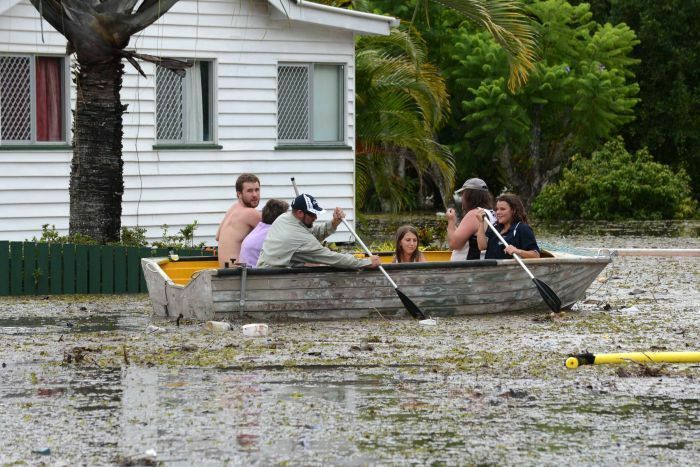 There’s more evacuations around Gympie. 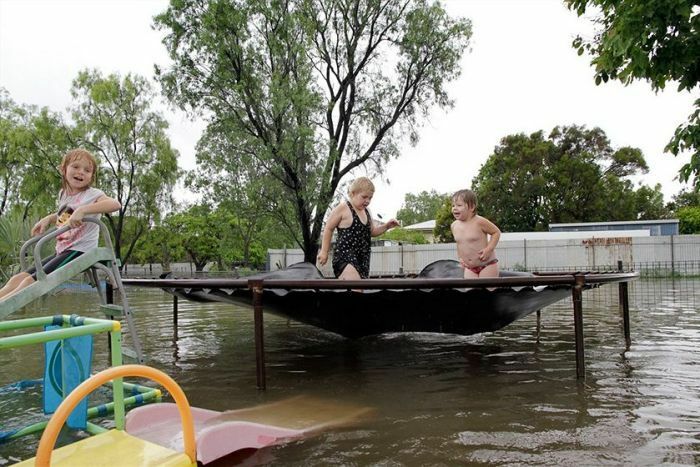 “Overnight there were people fearing for their lives as floodwaters were coming up. There was one woman – her husband was away and she was home alone with five children, with floodwaters coming up around the property. 7.00am: A swift water rescue is underway at Widgee creek near Gympie. 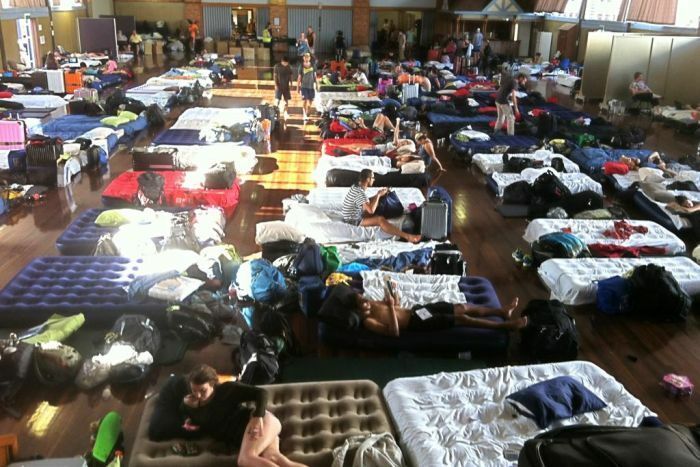 6.49am: Three evacuation centres have been placed on standby on the Sunshine Coast. The centres are located at Nambour, Caloundra and Noosa. 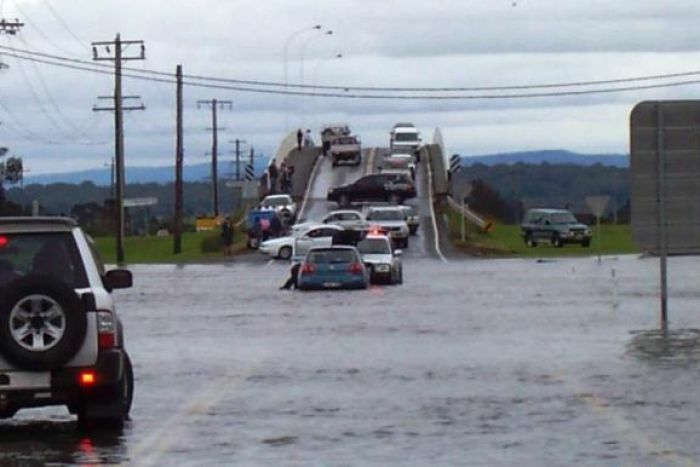 More than 200 millimetres of rain has fallen across many parts of the coast in the last 24 hours. 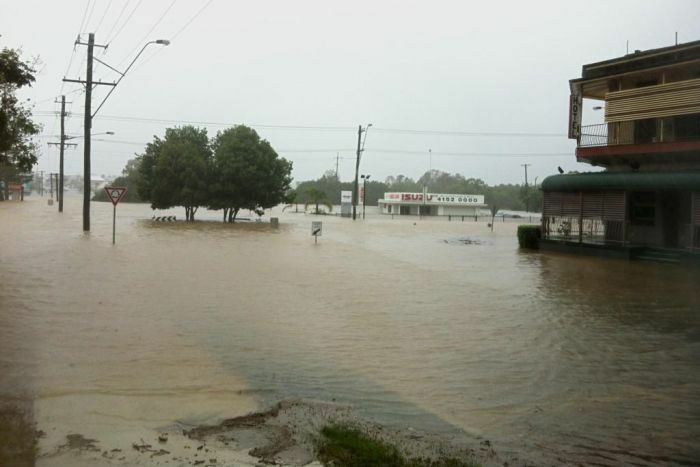 6.46am: The Bundaberg Council says more than 100 homes and businesses in the city’s east will flood. The Riverdale caravan park is being evacuated. 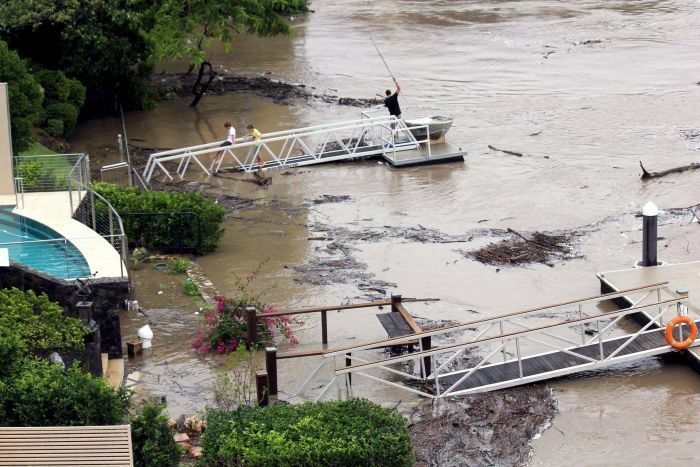 The council earlier warned that flood levels at the Burnett River will be higher than the 2010 levels. Here is the flood warning for the Burnett River. 6.31am: An update on power outages in the south-east. 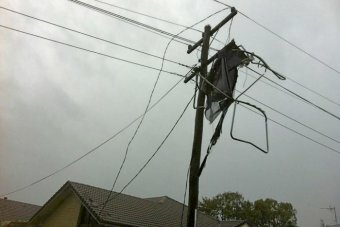 Energex says more than 6,000 customers are without power on the Sunshine Coast and more than 3,000 in the Gympie area. Just over 1,700 people are without power in Brisbane. 6.30am: As the system tracks south, conditions are expected to deteriorate further on the Sunshine Coast. 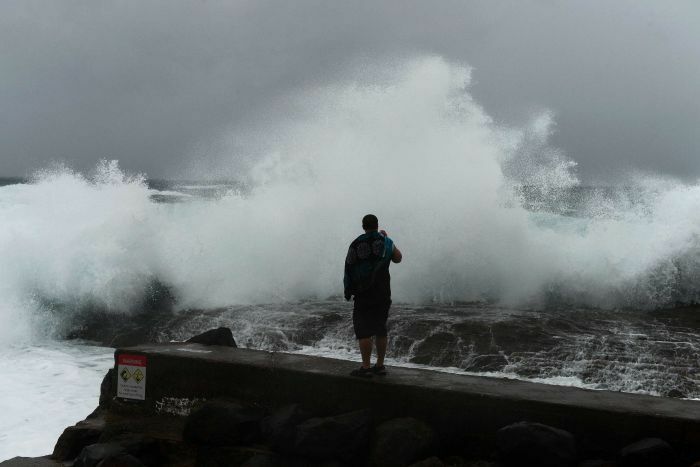 The weather bureau says the rain and wind will intensify, and there will be abnormally high tides and dangerous surf. 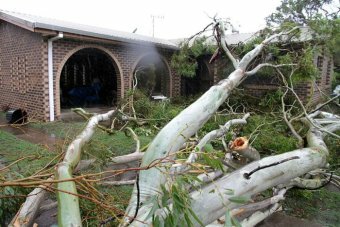 The SES has received more than 100 calls for help for leaking roofs, fallen trees and requests for sandbags. 6.25am: Paramedics say four people were injured when the tornado hit Burrum Heads this morning. 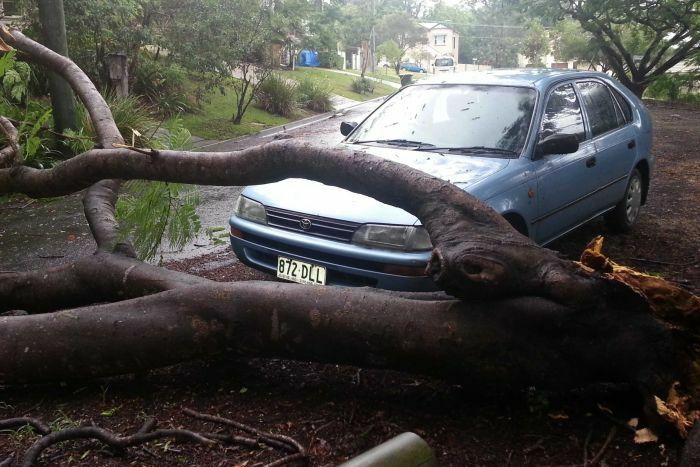 They say a tree fell on a man at the local caravan park. 6.11am: North Burnett Mayor Don Waugh says residents are still being evacuated at Gayndah. At first light, evacuations will begin at Mundubbera. 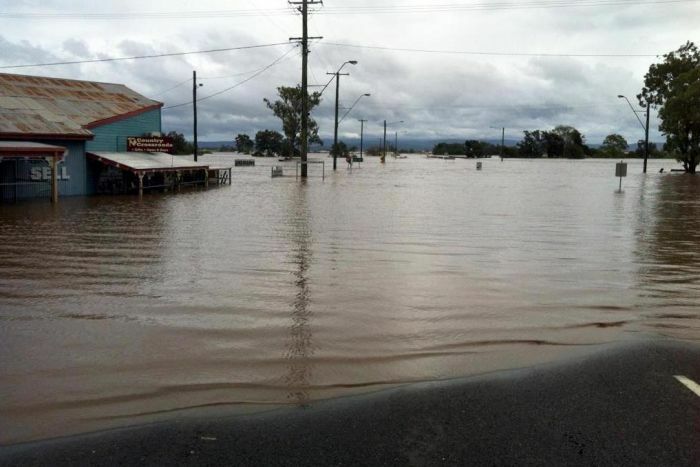 6.00am: In Gladstone, the rain has eased but authorities are watching the Awoonga Dam closely. 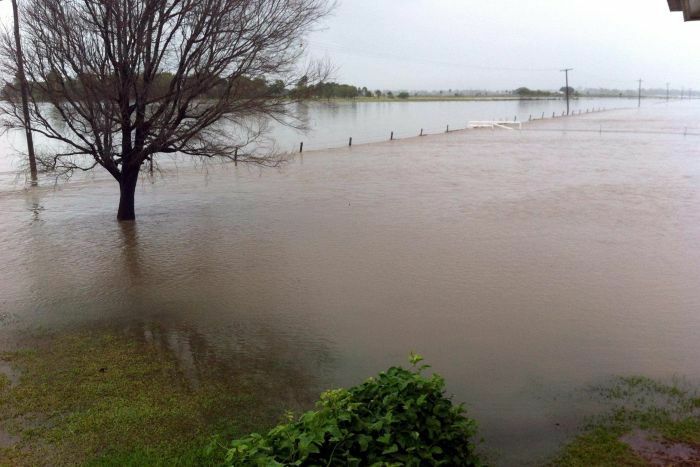 Ahead of expected major flooding, 400 homes near the Boyne River and a caravan park at Benaraby have been evacuated. “I won’t make that call yet, we’re not certain what’s going on up on the dam. 5.59am: The Weather Bureau has confirmed there was tornado activity over Bribie Island, north of Brisbane, earlier this morning. 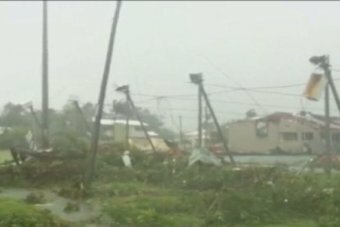 The bureau says more tornadoes are possible across the south-east today. 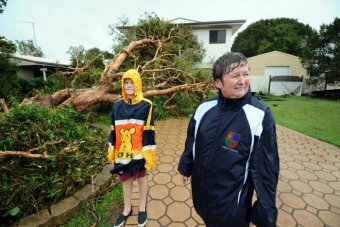 But it says strong wind gusts reported in Toowoomba overnight were not tornadoes. 5.47am: At this stage, airports in south-east Queensland do not appear to have been affected by the weather. 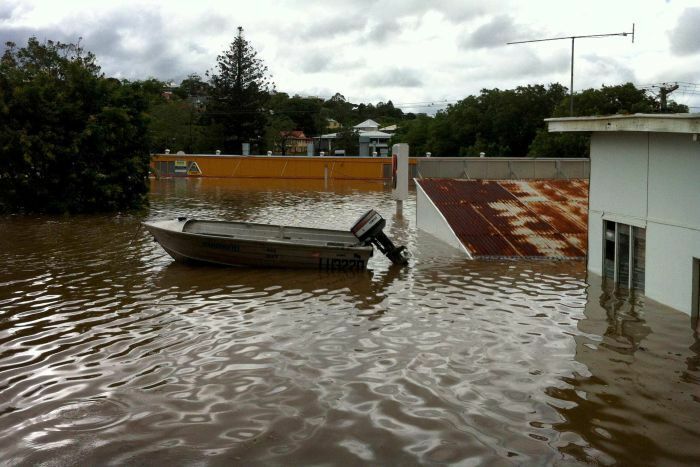 @FrancesAdcock The water is half a metre over the spillway at the #Mary river marina releasing vessels downstream. 5.40am: Emergency services are assessing the damage at Burrum Heads, near Bundaberg, after a sixth tornado event this morning. “We got woken with a terrible crash. There’s a tile from someone’s roof, we don’t know whose, has gone through out our front windows. 5.30am: A flood warning has been issued for the Mary River amid heavy rainfall. The warning affects areas including Gympie and Maryborough. 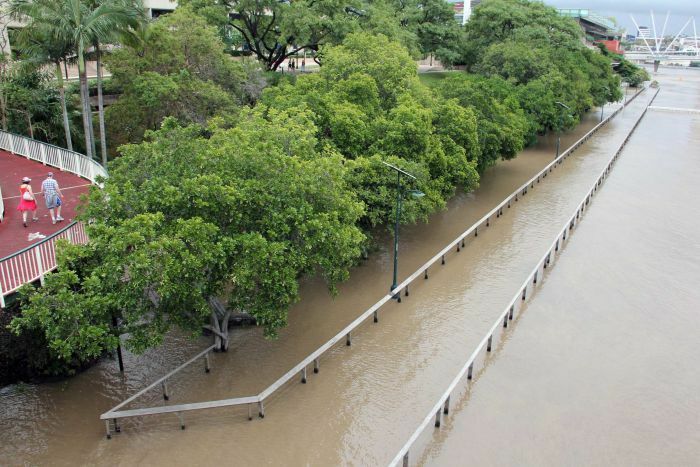 Flooding is also possible the Noosa River, Maroochy and Mooloolaba Rivers, Pine and Caboolture Rivers, Brisbane River, and Brisbane metropolitan creeks. Warnings for these catchments will be issued if required. 5.27am: The Bundaberg Council says flood levels at the Burnett River will be higher than the 2010 levels. 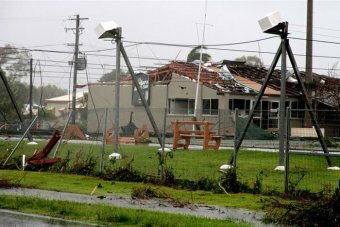 4.55am: Another tornado has struck in south-east Queensland, this time at Burrum Heads south of Bundaberg. Five tornadoes cut a path of destruction in and around Bundaberg, Bargara and Burnett Heads yesterday and the Department of Community Safety says another ripped through Burrum Heads this morning. “You can’t get outside to see much yet but there’s a fair bit of damage. @BruceGrady If tornado strikes stay indoors. Toilet or bathroom best option. Cover with mattress. 4.51am: A storm tide emergency alert has been issued for coastal areas in the Moreton Bay region. 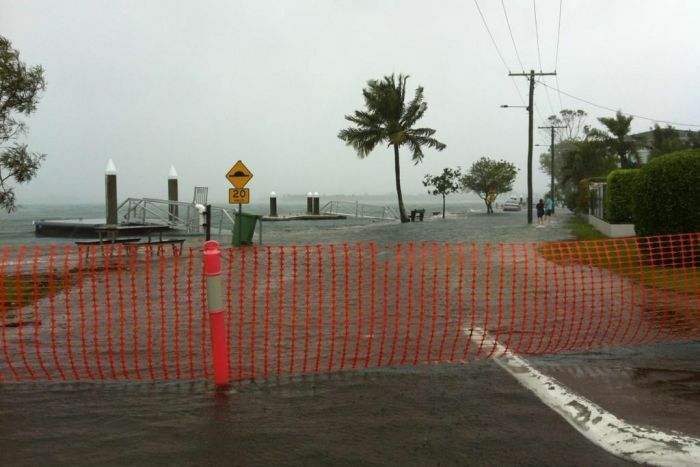 Authorities are warning that homes could be affected by a dangerous storm tide at 10.00am. 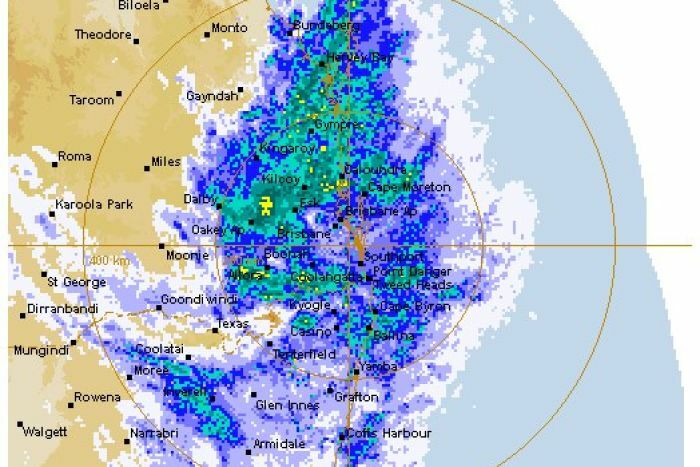 4.47am: As Oswald tracks south, gale force winds and heavy rain are developing along the New South Wales north coast. 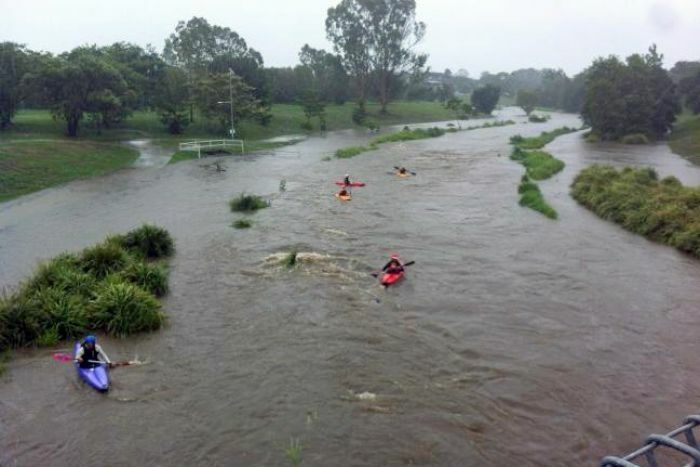 The storm is expected to dump up to 200 millimetres of water in some parts of the northern rivers and mid-north coast regions today. 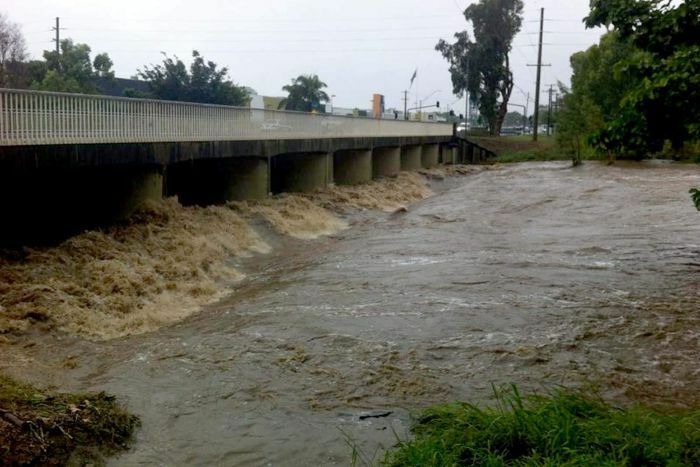 A flood watch is in place for several waterways, and officials are also warning of dangerous surf conditions. “My paddock is a river. I’ve got water flowing from canefields going across the boundary gully. 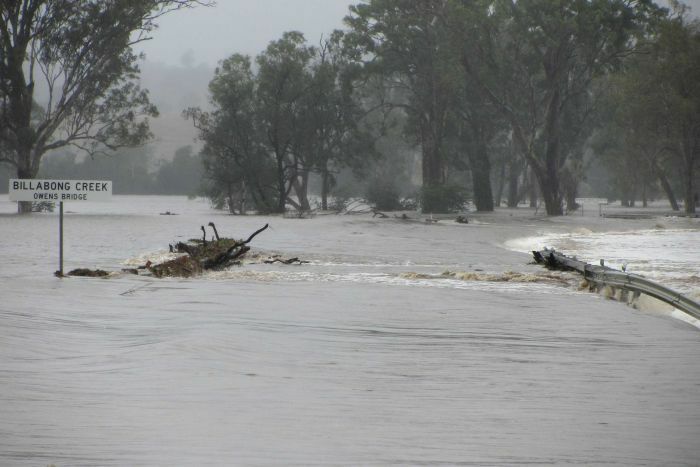 “I’m cut off to the south of the highway at Kurrajong Creek. I don’t know if I can get into Gin Gin. 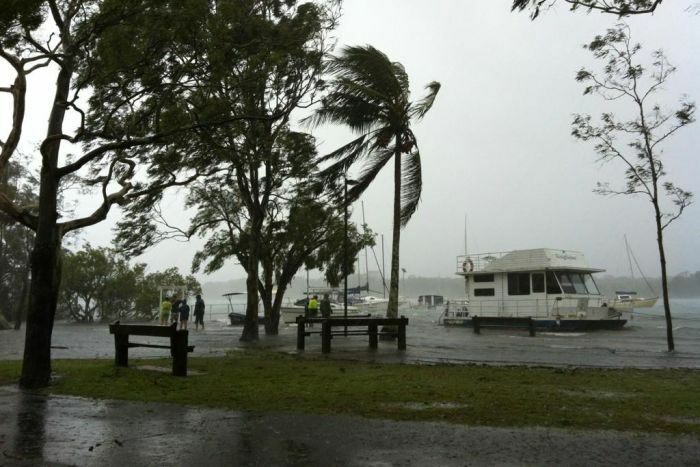 4:18am: The weather bureau says there are destructive winds in the Burrum Heads and Hervey Bay areas at the moment. Residents are urged to stay indoors. 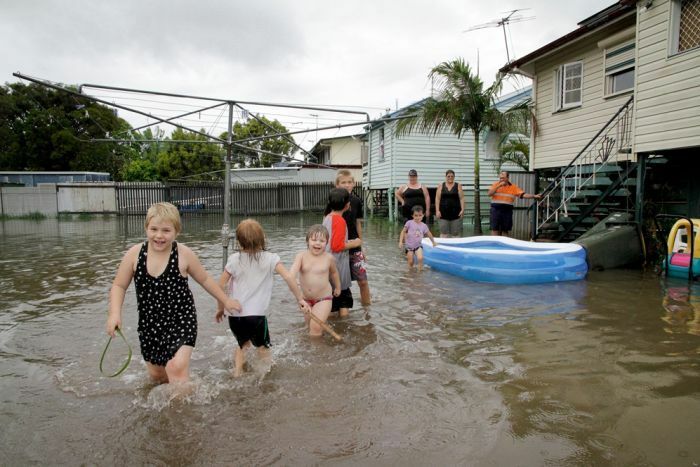 Meanwhile, homes and properties have been flooded at Lowmead between Bundaberg and Gladstone. “We have just lost everything. The house has gone under. “It started to come up and we sort of kept looking at it thinking, never in a million years would it happen but yep, we had to hop in a car and come up onto a hill. 4:10am: This picture of the Awoonga Dam spillway was taken yesterday. 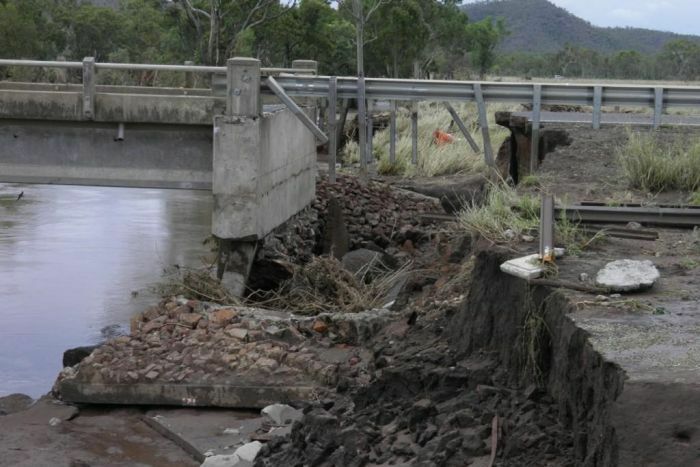 Overnight more than eight metres of water was flowing over the dam. 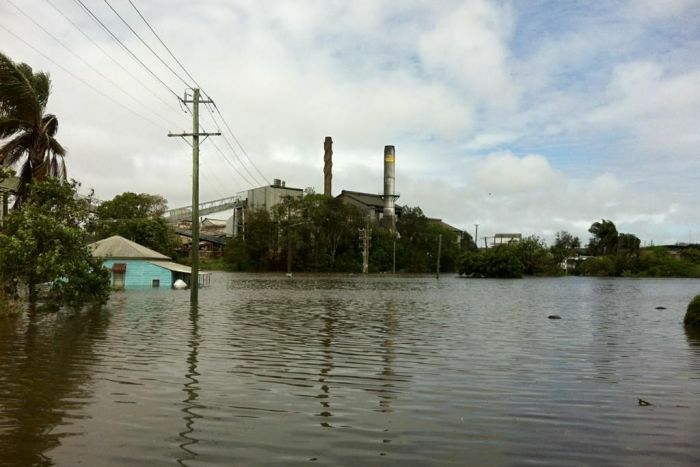 4:04am: In Gladstone low-lying properties downstream along the Boyne River are expected to be flooded this morning. Police and the SES have been out all night doorknocking homes at Boyne Island, Tannum Sands, Wurdong Heights, Boyne Valley, Awoonga and Pikes Crossing telling them to leave. Local Mayor Gail Sellers says it is unchartered territory and no-one knows how bad the flooding will be. 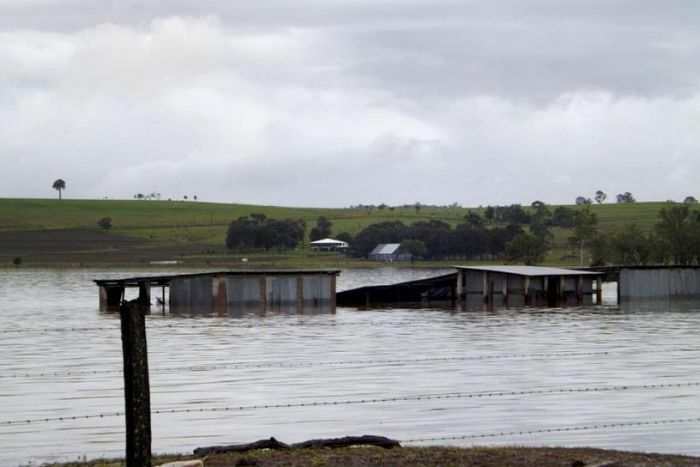 “At the moment we have 8.06 metres of water above the dam… It is still rising, it is flooding, it’s coming over the dam. “The advice that we’ve been getting from the Bureau of Meteorology was that there will be a minor to moderate flooding. More information can be found on the council’s Facebook page. 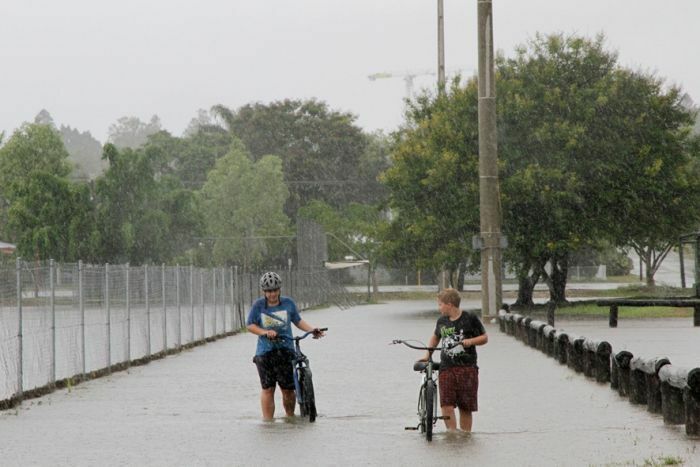 3:40am: Matt Dyer, from the Bundaberg Regional Council, has told ABC Local Radio that authorities are expecting major flooding in Bundaberg later today. He has urged those who were affected in 2010-11 to pay close attention to the situation. Mr Dyer also says a number of evacuation centres have been set-up, including at the Gin Gin showground’s function room and in central Bundaberg. More information can be found on the council’s website. 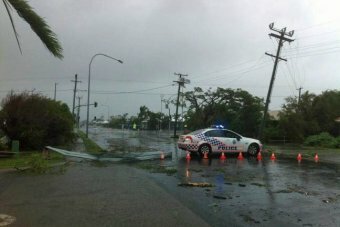 3:08am: Police have received multiple reports of tornado activity in the Hervey Bay region this morning, but blackouts, broken telephone lines and flooded roads are making it hard to confirm. Emergency Services are stretched to the limit responding to hundreds of calls for help from people whose homes were flooded or damaged by yesterday’s tornadoes. 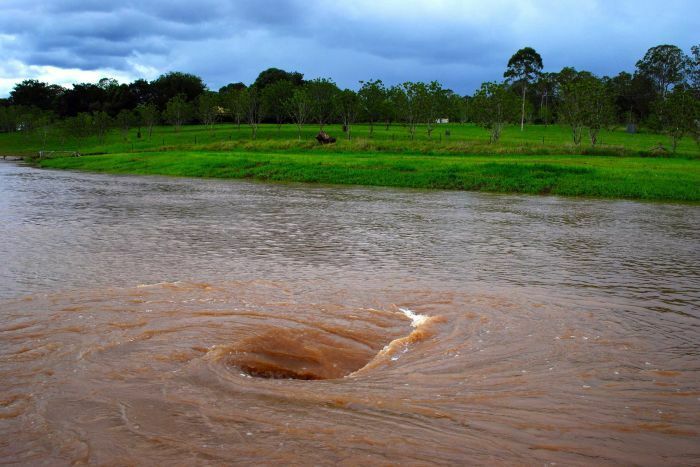 @QPSmedia #mythbuster Callide Dam near Biloela is not unstable. Controlled releases continue. Wide Bay Creek is a tributary of the Mary River. “We’re trying to from Howard get to Hervey Bay… We’ve been at a birthday party for [fellow entertainer] Tony Worsley. 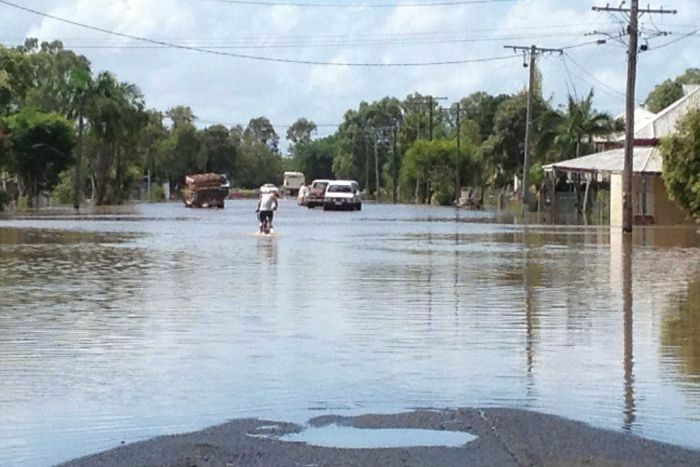 “We left about 10pm… but as we got onto the Bruce Highway, we hit a flood. “We got through… but one of the cars behind us was washed away, they were washed out of their car and later saved by other people. 2:16am: Queensland Police say evacuation centres are open at the town halls in Monto and Mundubbera, and at Gayndah high school. If heading to them, people are asked to take bedding, some food and your medicines. Kitchen facilities available on site. 2:04am: A severe thunderstorm warning has been issued for the Moreton Bay, parts of Brisbane city and Somerset Council areas. 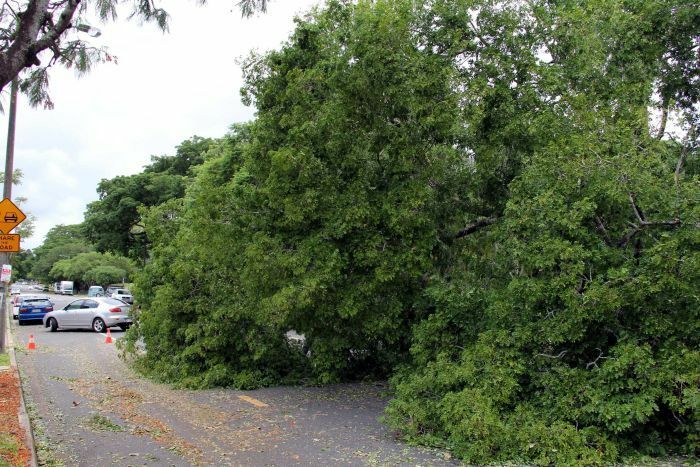 The bureau says destructive winds are likely to affect Redcliffe, Deception Bay waters and Beachmere by 2:20am and Strathpine, Lake Samsonvale and Dayboro by 2:50am. “The rain keeps pouring down… and the major flow hasn’t reached us yet. “The weir at Cania Gorge, it started at two metres, now it’s three-and-a-half metres over the spillway. 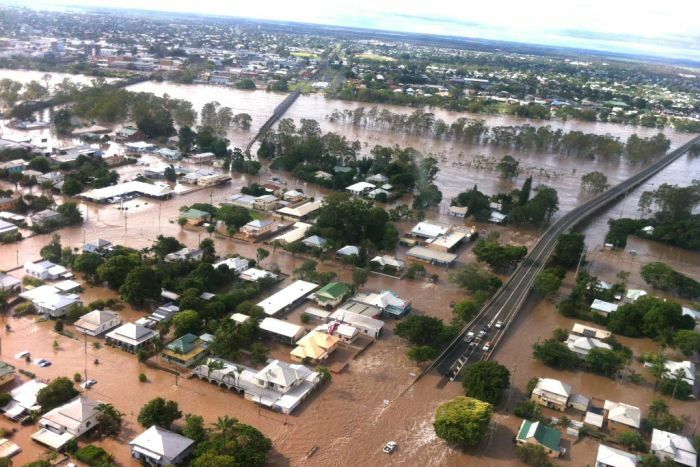 “Once it passes here, it will head down to Bundaberg… The amount of water that is coming down the river is incredible. 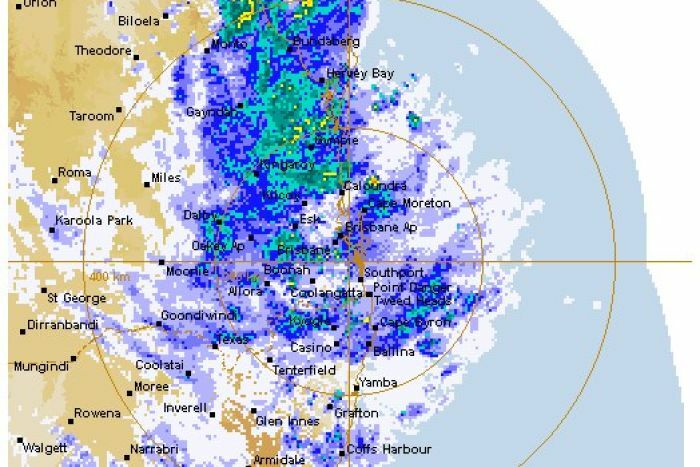 1:18am: The weather bureau says heavy rain is due in Brisbane by dawn this morning. 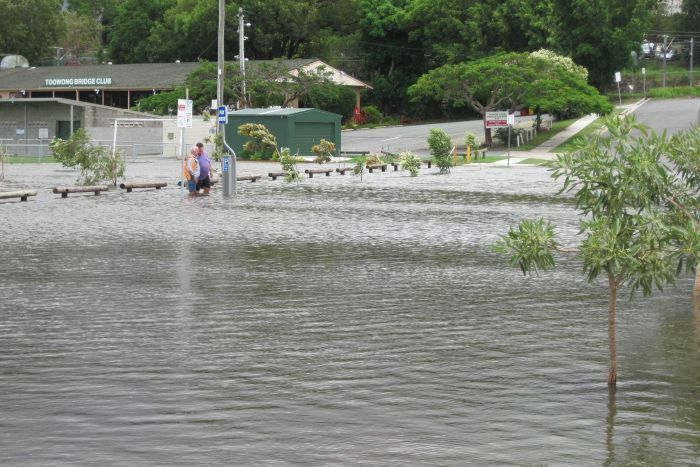 On the coast, the Moreton Bay Regional Council has warned of a dangerous storm tide. 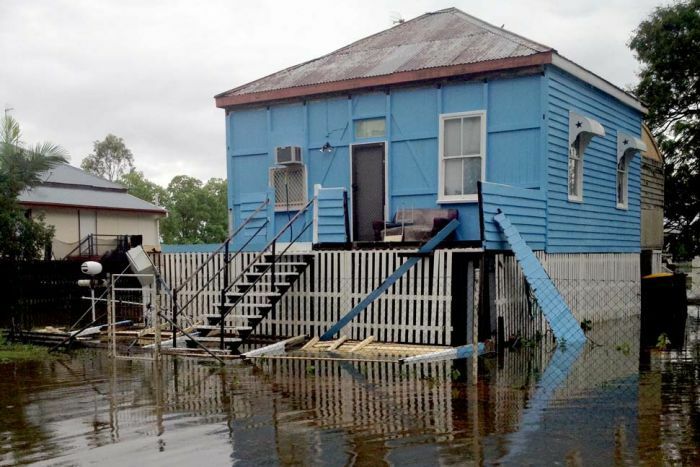 Residents in low-lying, coastal areas of Beachmere, Bellara, Bongaree, Donnybrook, Hays Inlet, Meldale, Scarborough and Toorbul are urged to remain on alert and ready to take action ahead of Sunday morning’s high tide, which is expected at 10am. 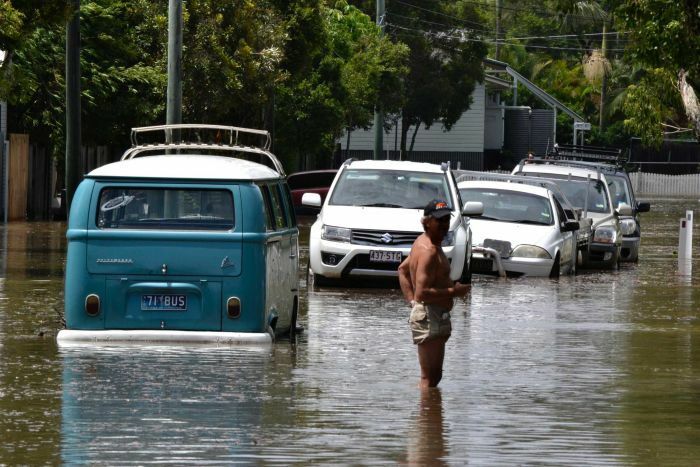 Based on advice from the Bureau of Meteorology, these low-lying coastal areas are expected to experience a tidal surge 0.5 metres higher than Saturday’s high tide. 1:08am: A flooding emergency alert has been issued for the Benaraby area of Gladstone. The Regional Council has advised additional water releases from the Awoonga Dam are expected to occur at 2am. 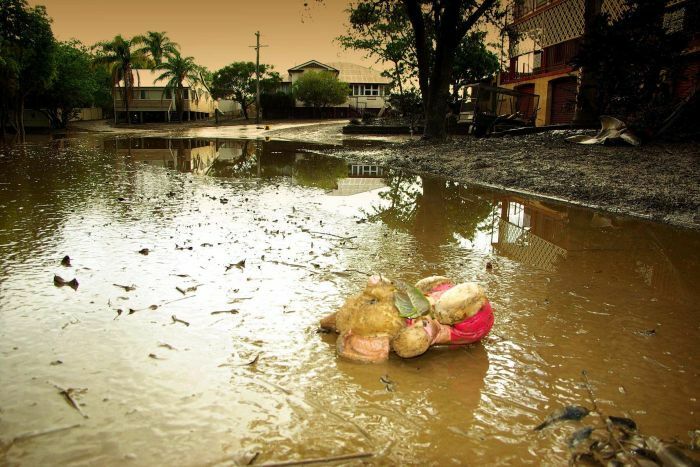 People in low-lying properties are urged to move to higher ground immediately. @QPSmedia RE report of tornado at Hervey Bay – at this time we can’t verify these reports. 12:47am: Gladstone update: Flood peak of the Boyne River is expected at 2:30am. 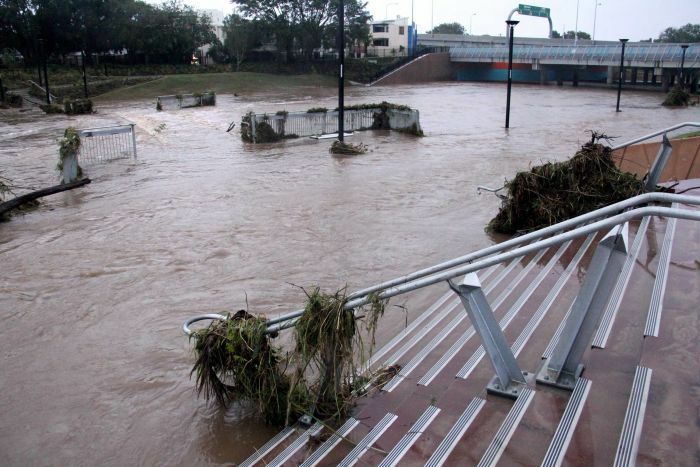 People in affected areas are urged to go to evacuation centres, if possible. 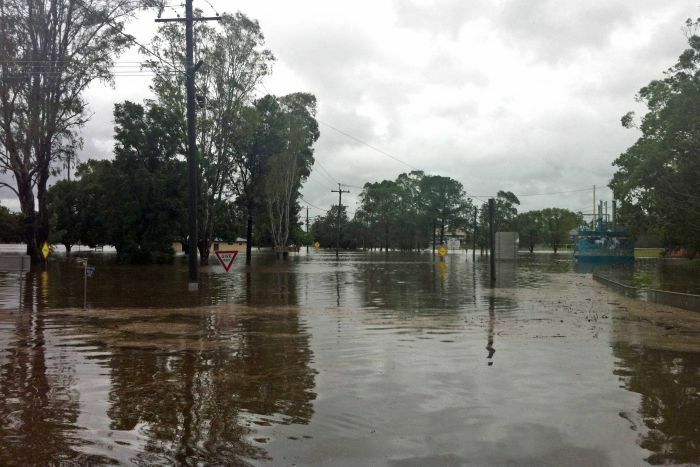 12:36am: There is also a flooding emergency alert tonight for residents of Biloela in central Queensland. 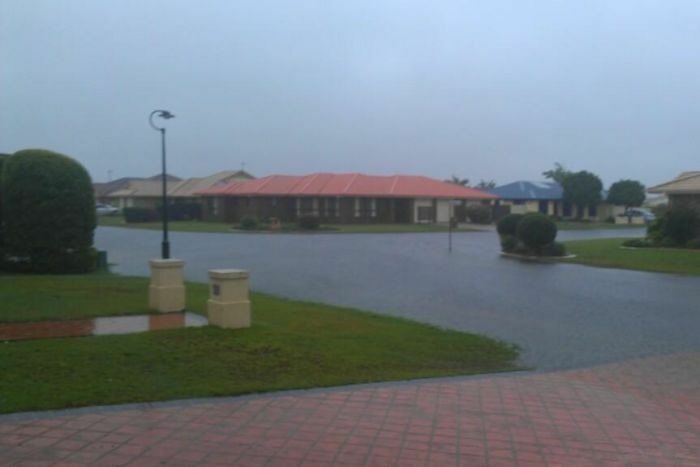 The Banana Regional Shire Council is advising people in low-lying areas of Biloela to move to higher ground or to the local Civic Centre. Residents are asked to take bedding and essential supplies. 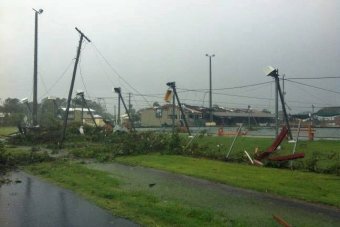 12:16am: The weather bureau is warning residents in the Wide Bay-Burnett region to prepare for more tornadoes overnight and on Sunday. “Unfortunately we can’t really narrow it down to very specific areas because these cells rapidly come in and die just as quickly as they intensify. 12:02am: In Gladstone, more than seven metres of water is flowing over the Awoonga Dam. Local Mayor Gail Sellers says the emergency affects about 800 residents of Boyne Island, Tannum Sands and Benarby. “We have never been at this height before. It is all unknown because the last time the dam went over in 2010 and 2011 floods, it was 4.6 flowing over the spillway. “At the moment we are getting 7.9 metres.